What's up with the 'Pink Moon'? The Pink Moon rises on Friday, April 19. The full moon of April, called the Pink Moon, will occur the morning of April 19 at 7:12 a.m. EDT (1112 GMT), about three days before the annual Lyrid meteor shower peaks. While bright moonlight can outshine the "shooting stars" during the full moon, the meteor shower will be easier to see come Earth Day (April 22). The full moon will be three days past perigee, the point in its orbit where the natural satellite is nearest to Earth, so it will almost be a "supermoon," appearing larger than average. Supermoons happen when the full moon coincides with perigee, but the difference in size even for these "super" satellites is usually too small for any but the most careful observers to notice. For observers on the U.S. East Coast, the Pink Moon will rise at about 8 p.m. the evening of April 19 and set at around 7 a.m. the next morning, according to the U.S. Naval Observatory. The moon will be in the constellation Virgo. The sun will rise about an hour before moonset on April 20, so for about an hour, the nearly full moon and the sun will both appear in the sky. The full moon occurs when the satellite is exactly on the opposite side of the Earth from the sun. The moon shines by reflecting the sun's light, unless its orbit carries it within the shadow of the Earth, resulting in a lunar eclipse. That won't happen in April; the next lunar eclipse, in which the Earth's shadow partially covers the moon, will be July 16-17. That partial lunar eclipse won't be visible from North America, but skywatchers in South America, Europe, Africa, Asia and Australia will see it, according to NASA's Goddard Space Flight Center. While there will be no eclipse in April, the near-full moon may appear just slightly larger than average on April 16, when it reaches perigee. The average distance from Earth to the moon is about 238,855 miles (384,400 kilometers). At perigee, that distance can be as close as 225,623 miles (363,104 kilometers). And at apogee, the satellite's farthest point from Earth, the moon can be up to 252,088 miles (405,696 km) away from the planet. The moon's distance from Earth varies because the satellite's orbit isn't a perfect circle. The moon's apparent diameter will look a little smaller since it will be two days past that point, but this size difference, too, is too small to notice with the naked eye for all but the most careful observers. Through binoculars or a small telescope, the full moon appears very bright, so much so that you may not be able to see through the glare without special moon filters. Unlike observing the sun (which one should never do through a telescope without proper eye protection), observing the full moon poses no danger to one's eyesight. However, details on the full moon's surface can be more difficult to see than when the moon is at crescent or quarter phases. The reason is lack of contrast; a full moon means we are seeing the surface at lunar noon, when there are no shadows toward the center of the disk or even toward the edges. (If one were standing on the center of the moon's face, the sun would be directly overhead.) Moon filters can make some features stand out, or you can simply wait a few days after the full moon or observe a few days before it, when shadows make spotting the surface topography easier. While the moon was at perigee on April 16, Mercury and Venus were only 4.3 degrees apart in the morning sky. And on the day of the full moon, they will be similarly close, according to skywatching site When the Curves Line Up. This won't be a conjunction, in which the planets share the same celestial longitude (the longitude lines of Earth as projected on the sky). But the upcoming planetary alignment will still help observers find Mercury, which can be elusive due to its proximity to the sun. The innermost planet is never that far from the horizon and either sets soon after the sun does or rises soon before the star. Before the full moon sets on the morning of April 19, Mercury and Venus will be visible above the eastern horizon shortly before sunrise. On April 19, the day of the full moon, Venus and Mercury will rise at 5:10 a.m. and 5:25 a.m., respectively, in New York City, where the sun will rise at 6:11 a.m. local time. By the time Mercury rises, the sky will be getting lighter and visibly bluer in the direction of the rising sun. About 30 minutes before the sun comes up, Venus will be only about 6 degrees above the horizon; Mercury's elevation will be only 3 degrees. Both planets are in the constellation Pisces. This sky map shows the conjunction between the moon and Jupiter on April 23, 2019. On April 23, four days after the full moon, there will be a conjunction of the moon and Jupiter at 7:35 a.m. EDT (1135 GMT). The moon and Jupiter will both be in the constellation Ophiuchus and pass about 1.6 degrees from each other, or about three lunar diameters, according to observing site in-the-sky.org. The moment of conjunction will be during the day, but before sunrise one can catch the pair in the southwestern sky. The Pink Moon isn't really pink. The Pink Moon rises over Boston in this photo taken by Chris Cook on April 11, 2017. April's full moon isn't actually pink; it's named after the wild ground phlox, one of the first flowers to bloom in spring. However, the moon can appear red-orange due to the composition of Earth's atmosphere and the angle at which it is viewed. Despite its moniker, the Pink Moon isn't actually pink. The name "Pink Moon" comes from the bloom of ground phlox, a pink flower common in North America, according to The Old Farmer's Almanac. It has also been called the Sprouting Grass Moon, the Egg Moon and the Fish Moon. 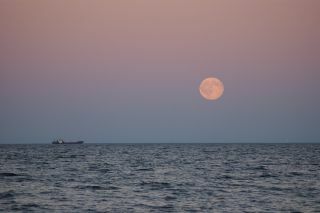 According to the Ontario Native Literacy Coalition, the Ojibwe peoples indigenous to North America called it the Sucker Moon after the common fish species known as suckerfish. This fish, also known as the remora, is one of the animals that the Ojibwe saw as a messenger between the spirit world and ours. In the same region, the Cree called April's full moon the Goose Moon, as April was the month when geese returned to the north after migrating south for the winter. The Tlingit of the Pacific Northwest call the April full moon "X'eigaa Kayaaní Dís," meaning "Budding moon of plants and shrubs," according to the Tlingit Moon and Tide Teaching Resource published by the University of Alaska at Fairbanks. In New Zealand, the Māori people had much different traditions for their April full moons, because in the Southern Hemisphere, April arrives in autumn. The Māori called the April moon "Paenga-whāwhā," describing the month as a time when "all straw is now stacked at the borders of the plantations," according to The Encyclopedia of New Zealand. For the Jewish people, April 20 marks the beginning of the holiday of Passover (the 15th day of the lunar month of Nisan), which celebrates the escape from Egypt and has been popularized by films such as "The Ten Commandments" and Disney's "The Prince of Egypt." Follow us on Twitter @Spacedotcom and on Facebook.